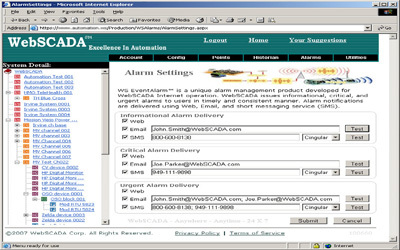 WS EventAlarm™ is a unique alarm management product developed for WebSCADA Internet operation. It reports exceptional conditions and notable WebSCADA system events to WebSCADA users in timely and consistent manner using Email, page, instant message, and voice mail. WS EventAlarm lets users manage, display, and print event alarms in web browsers anywhere anytime for analysis and reporting purposes. WS EventAlarm enables users to specify event data to be displayed by applying custom filters to both current and historical retrieved events. Such custom filters can be created, saved, and recalled instantly within web browsers. In addition, WS EventAlarm provides a mechanism to users to acknowledge event alarms automatically or manually. Acknowledgements of event alarms are configurable in WS SysConfig, and all event alarms can be acknowledged, cleared, or ignored at users’ requests.